I know this has nothing to do with sports. Quite frankly, I don't want it to. This is bigger than anything going on in the world of sports. This is us. This is country. This is real. This is heavy. 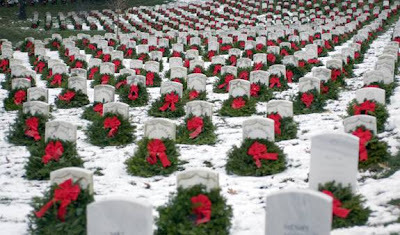 One man cares enough to make sure every grave at Arlington National Cemetery has its own wreath at Christmas. At no expense to anyone but himself. He feels the price has already been paid. And it has been paid by those who occupy those many grave sites at our National Cemetery. What a story. I encourage you to research it yourself. You'll be blessed. I promise you will. If you only take the time to read one post on An Opinion On Sports, I hope this one could be it. May God bless you and yours during this joyous season, may God bless all of those who make this wreath project possible, and may God bless America. Merry Christmas everyone!